What do you do when you get a last-minute invite to a wedding and you have to wear an ethnic outfit that hasn’t been repeated twice in the past two months? What do you do when not going is not an option because that cute guy from the boy’s side is going to be there? We all have at least one floral mini dress in our closet, don’t we? I figured out a way to get Sabyasachi vibes without putting your kidneys up for sale. This is my genius outfit moment, guys! Wear with: A flared sharara, an embellished dupatta, elaborate earrings and maangtika. Top it off with a potli bag. Who would’ve thought, right? You have no idea what a delicate camisole can do for your Indian look. And if you’re worried about awkward stares, the nightwear-as-partywear trend is on your side. Wear with: A plain satin saree with a glittery border, pearl jewellery, a statement clutch and matching heels. This western fashion item is a life-saver. A few additions and it transforms into an effortless Indian essential. Whether it’s printed or a solid shade, a great maxi skirt is a wardrobe must-have. Wear with: Embellished or embroidered choli, matching dupatta, statement jhumkas and bangles, and juttis. If you have this, great. And if you don’t, a quick trip to the mall will never leave you disappointed. Pick one with delicate prints or a statement fashion element like a fringe, or tassels. Wear with: A modest bralette in a basic colour, an embellished lehenga skirt, a box clutch and Kolhapuri wedges. Sequins, sigh, what would we do without you? Again, if you don’t have this fashion trend in your closet (although, I doubt it) a sprint to your nearest F21 or H&M will do the job. This western wardrobe item turns into a sangeet worthy outfit in seconds. Wear with: Matching flared pants or a garara, a simple dupatta, diamond studs and peep-toe pumps. A western hit, these statement earrings are all the jewellery you need to add some newness to an old Indian outfit. 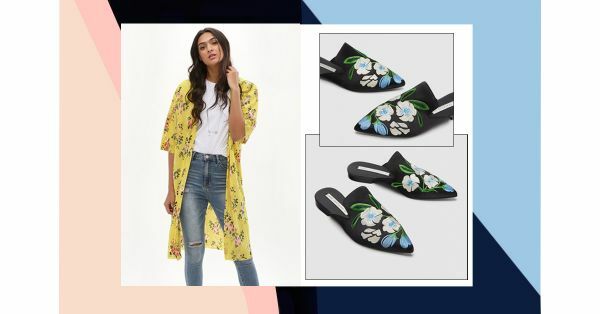 Wear with: A party-worthy cropped top, matching high-waisted dhoti pants and dupatta, strappy heels and an evening clutch. The western off-shoulder blouse is every girl’s best friend. It’s a popular wardrobe item and for good reason - whatever the mood, the off-shoulder top has got your back. Here’s how you make it work with your Indian look… Wear with: Embellished palazzos and dupatta or saree (tuck it in or wear it out), an eclectic choker, a hand harness/hathphool, a satin clutch and heels. The options are plenty. An embellished or statement buckle belt added to any Indian outfit can turn the look around. Pick something that complements your desi look. Western to Indian and back! Wear with: An anarkali and dupatta or saree, cocktail ring, box clutch and heels. Embroidered mules are all the rage and you know it. They’re a personal go-to when I want to be on point but also comfy enough to walk all day if I have to. Wear with: Contemporary Indian styles like bandhgala suits and trousers, or a short peplum kurti and pleated sharara. Accessorise with a metallic cuff, earrings and an evening bag. I can’t read minds but I know you have one in your closet. Use this western item as a statement blouse for a unique Indian look. Pick colours that match the rest of your outfit. Wear with: Any kind of Indian bottoms - lehengas, sarees, dhoti pants or shararas. Add a quirky dupatta drape and accessories. Change up your Indian look with a well-tailored formal jumpsuit. A western favourite, the flared bottom jumpsuit is your best bet for a one-of-a-kind desi ensemble. Wear with: A silk dupatta, heavy jewellery and party heels. I love culottes. They’re super flattering and sophisticated. The wide-legged, cropped trend is, legit, so versatile. Which is why you need this Indian wear fashion hack courtesy this western wardrobe item. Wear with: Everything. Kurtas, linen tunics, embroidered Indian jackets… Add antique earrings and bangles, a quirky jhola and Kolhapuris.